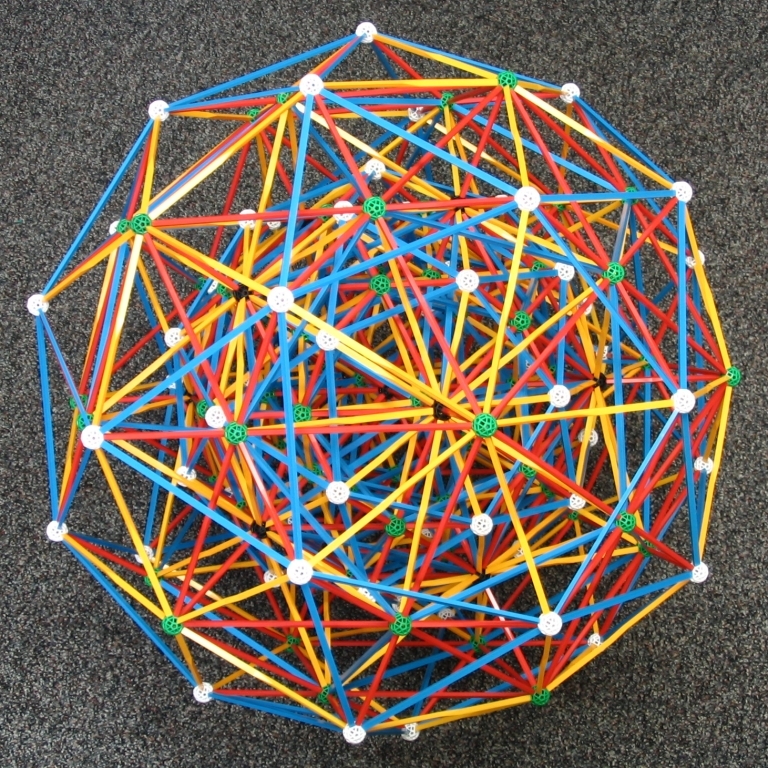 This is a Zome model of Gosset's figure 421 in 8 dimensions. The vertices of 421 (from here on called "Gosset's figure") coincide with the 240 shortest non-zero elements of the E(8) lattice, also known as the E(8) root system. This page has brief descriptions on how to build the model and the mathematics behind the model. For more details on the mathematics, one should consult the references given below. A requisite first step to understanding this model is to study the geometry and Zome model of the 600-cell. As it turns out, this model of Gosset's figure is the union of two concentric models of the 600-cell. It is a remarkable fact that there are only two "natural" models of the 600-cell which can be built using standard Zome pieces, and that the union of these two objects turns out to represent the Gosset figure. Before attempting to build the Zome model of Gosset's figure, one should build two different sizes of the Zome model of the 600-cell, where the ratio of the two radii, naturally, are in golden proportion. 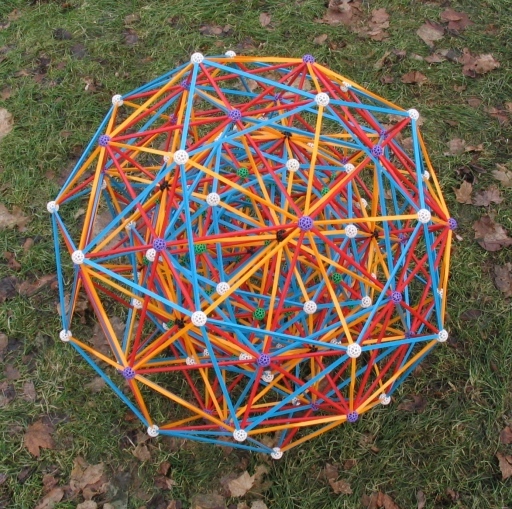 One may find instructions on how to build the Zome model of the 600-cell here. After doing this, one can move on to Gosset's figure. First build the smaller of the two Zome models of the 600-cell. Having done this, one may build the larger of the two where the smaller serves as a core. Upon building the larger of the two around the smaller, one will notice that many of the blue edges meet in false intersections. This model is the union of two concenteric models of the 600-cell, one large and one small. 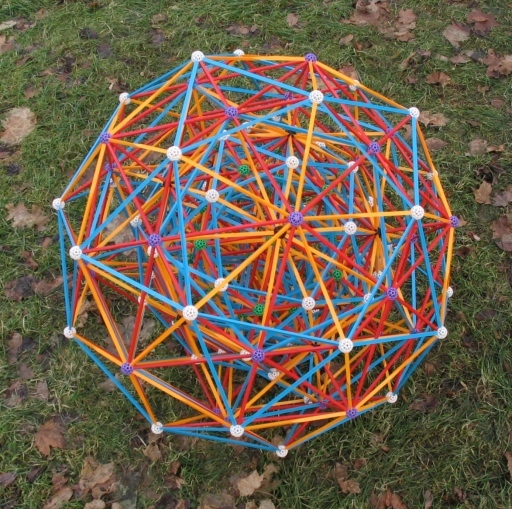 Exactly 30 of the blue edges on the outer shell of the small model intersect 30 of the blue edges of the core icosahedron of the large model. Instead of resorting to half-blue struts, one can build the model so that 30 of the long blue struts of the large 600-cell are bent around 30 of the medium blue struts of the small 600-cell. One should note that this is a "vertex model" of Gosset's figure. That is, although all of the vertices are represented by balls, many of the projected edges are not present in the model. The difficulty arises because there are simply too many edges. While it is true that all of the projected edges lie in the usual red, blue, or yellow zones of Zome, many of them are too short to be included. This model illustrates a phenomenon of "density variation". Gosset's figure in eight dimensions can be regarded to "reside" on the surface of an 8-dimensional ball. In fact, all of the vertices of Gosset's figure are equidistant from the origin in 8-dimensional space, and all of the edges lie in one orbit of the group acting on it. Thus, in some sense, Gosset's figure is "uniform" in the way it is distributed about the 7-dimensional sphere. The model, however, represents the image of an orthogonal projection from 8-dimensional space to 3-dimensional space. The measure on the 3-dimensional ball induced by this projection, assuming the measure on the 7-sphere to be invariant, has a greater density towards the center of the ball. One can clearly see this phenomenon in this model because it has more "stuff" near the center. Here is a brief outline of some of the mathematics of Gosset's figure and why Zome works so well to model it. If the reader needs more details, the references given below, especially the article by Moody and Patera, are certainly more complete and probably more clear. a = (1-sqrt(5))/2, and b = (1+sqrt(5))/2. In other words, suppose b is the Golden Ratio, and a is its field-theoretic conjugate. i^2 = j^2 = k^2 = ijk = -1.
from R4 to R3, where the balls occupy the locations of the projected vertices. Under the usual quaternion norm, L is a dense subset of the quaternions H. One may regard this subset as the source of many quasicrystalline phenomena. However, under the icosian norm, L is isomorphic to the root lattice L(8) for the exceptional Lie algebra E(8). There are 240 vectors of minimal norm in this lattice, and these are none other than than the vertices of Gosset's figure. The Zome model works because the small 600-cell is scaled down from the large 600-cell in the same way the set T is scaled down from the set S, namely, by dividing by the Golden Ratio. Cross-section of the brain of a Zomer, chronic stage. Veit Elser and N. J. A. Sloane. A highly symmetric four-dimensional quasicrystal. Phys. A: Math. Gen. 20 (1987), 6161-6168. J. H. Conway and N. J. A. Sloane. 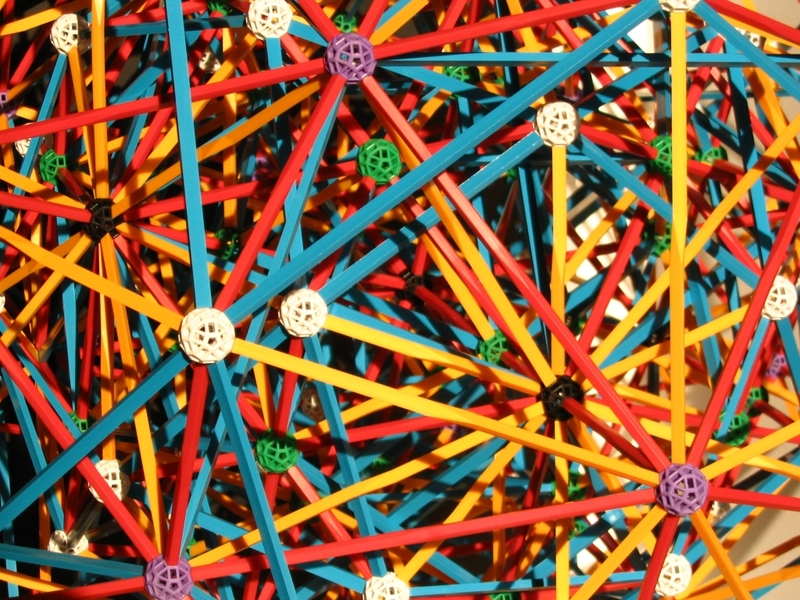 Sphere Packings, Lattices and Groups. 2nd ed. Springer-Verlag, New York, 1992. Thorold Gosset. On the regular and semi-regular figures in space of n dimensions. Messenger of Math. 29 (1900), 43-48. R. V. Moody and J. Patera. Quasicrystals and icosians. Phys. A: Math. Gen. 26 (1993), 2829-2853.